In actions, in deeds, and even in thoughts. Humble, forgiving, nice and many more. 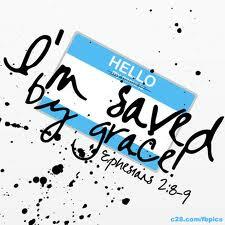 I remember His grace, which saved me initially. And that keeps me going, and gives me the assurance. And then the assurance that when “I call upon the name of God I will be saved”. And that keeps me going though out, encouraging me not to give up because He would never give up on me. That is why each time in my Christian walk I make it a point to remember that I walk not by my power, but by He that called me according to His purpose. So when I say I am a Christian I put my trust in God to see me though it all. When I say I am a Christian, I say I am not perfect myself, but with God I am.